Gaza terrorists discover new weapon as Hamas promises to end kite terror. Hamas leaders agreed to gradually end the wave of arson and rocket terror, Al-Quds reported. The arson terror has been mostly caused by incendiary kites and balloons, armed with explosives, which are sent into Israeli territory. 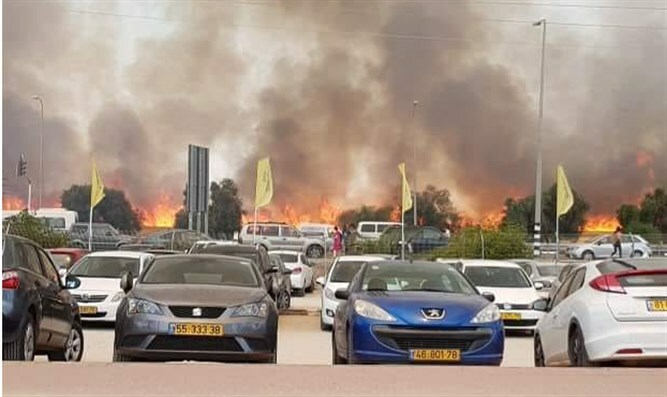 Over the past three months, this "kite terror" has scorched over 25,000 dunams (6,177.6 acres) of Israeli land, most of which is agricultural land, nature reserves, and forests. According to Al-Quds, the kite terror will end next week. It is not clear if Hamas will also stop Gazan terrorists from using birds or toys carry explosives. On Tuesday, a falcon landing in Israel was found to have a harness with explosive material strapped to its leg. According to the Arabic Ma'an news site, Gazan terrorists are now attaching explosives to helium-filled bath and pool toys with the intention of causing fires in Israel. The terror group believes that since the helium-filled toys are sturdier than the balloons, they will reach further into Israel.